Original Editors - Kevin Boothe from Bellarmine University's Pathophysiology of Complex Patient Problems project. Causes of kwashiorkor other than protein-deficient diet include poor intestinal absorption, chronic alcoholism, kidney disease, infections, and trauma (burns) that lead to an increase need of protein and caloric intake and results in loss of protein due to the body's demand to repair. The increase in caloric intake is first administered in the form of carbohydrates, simple sugars, and fats to provide the child with the adequate calories to provide energy for cellular function and metabolism. Once energy demands are met, proteins are incorporated into the diet, along with essential vitamin and mineral supplements.2,3 The consumption of dried milk formula has been proven most efficient and effective for treatment of kwashiorkor, but many malnourished children have developed a lactose intolerance. Administration of enzyme lactase assists in milk tolerance.4,2,3 There are current and past studies evaluating the use of plant proteins to provide the adequate amounts needed. Concentrated milk has provided best results, but mixtures of plant proteins have also been shown to be effective. Cooking bananas were found to be excellent vehicles for the proteins and providing a source of carbohydrates. This allowed for altering the diet by decreasing sugar intake, while providing nutrition and a sweet tasting alternative to products that are sweetened with sugar.15 Milk does have some disadvantages when used for medical treatment. An excessive amount of milk can lead to severe diarrhea, resulting in dehydration and loss of nutrients. A diet controlled by supplementing calcium caseinate, a source of protein, allows medical staff to differentiate if the the diarrhea is caused by excess carbohydrates (from lactose in the milk) or due to an infection. This allows for an appropriate treatment of antibiotics to be administered for diarrhea due to an infection. British Medical Research Council's Infantile Malnutrition Group at Mulago Hospital, Kampala have been looking at alternative substitutes for animal protein, which is not cost efficient. The Group has viewed options using soya oil and cotton-seed oil, both of which provide nutrients and calories from fat that are essential for protein synthesis, and are cost efficient and native to areas where Kwashiorkor is prevelant. The use of oil based substitutes allows for an increase in the intake of calories, which is important due to associated anorexia with the disease.16 There are other alternative options for adequate protein in diet with available resources, by utilizing complementary proteins in the diet. Examples include rice and beans and peanut butter and bread, which must be consumed at same time for the benefits. The primary medical intervention is to treat kwashiorkors with an adequate diet. It is more likely for Physical Therapy to play a crucial role in the nursing home setting. Once the patient's diet has been balanced and they are receiving the adequate amount of calories and nutrients, then physical therapy intervention can be applied. If the patient's diet is not adequately met, then the physical therapy intervention will add an increase in energy demands that is not being met, and the intervention will be detrimential instead of beneficial. Physical Therapy intervention should include a general strength and aerobic conditioning program to minimize signs and symptoms associated with kwashiorkor (muscle atrophy and fatigue). Lewis B, Hansen JDL, Wittman W, Krut LH, Stewart F. Plasma free fatty acids in kwashiorkor and the pathogenesis of the fatty liver. American Journal of Clinical Nutrition. 1964; 15:161-168. Available at http://www.ajcn.org. Accessed on March 30, 2011. Kwashiorkor: New York Times Health Guide http://health.nytimes.com/health/guides/disease/kwashiorkor/overview.html April 5, 2011. 1. Shashidhar HR, Grigsby DG. Malnutrition. eMedicine. 2009. Available at http://emedicine.medscape.com/article/985140-overview. Accessed March 9th, 2011. 2. Kaneshiro NK, Zieve D. Kwashiorkor. Pub Med Health. 2010. Available at http://www.ncbi.nlm.nih.gov/pubmedhealth/PMH0002571. Accessed February 22, 2011. 3. Kaneshiro NK, Zieve D. Kwashiorkor: MedlinePlus Medical Encyclopedia. Medline Plus. 2010. Available at http://www.nlm.nih.gov/medlineplus/ency/article/001604.htm. Accessed February 22, 2011. 4. 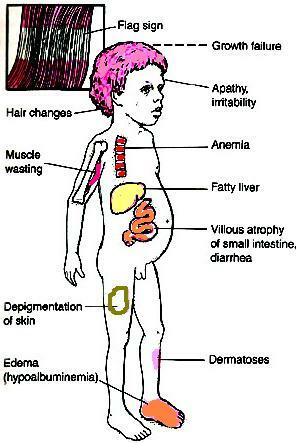 Kwashiorkor (Pathology). Britannica Online Encyclopedia. Available at http://www.britannica.com/EBcheck/topic/325852/kwashiorkor. Accessed March 9, 2011. 5. Kwashiorkor. Columbia Electronic Encyclopedia. 6th ed. 2010. Available at http://web.ebscohost.com.libproxy.bellarmine.edu.ehost. Accessed March 9, 2011. 6. Kwashiorkor. University of Maryland Medical Center. 2011. Available at http://www.umm.edu/ency/article/001604.htm. Accessed March 17, 2011. 7. Dermatitis. Mayo Clinic. 201. Available at http://www.MayoClinic.com. Accessed on March 30, 2011. 8. Dermatosis. American Heritage Medical Dictionary. 2007. Available at http://www.medical-dictionary.thefreedictionary.com/dermatosis. Accessed on March 30, 2011. 9. Peralta R, Rubery BA, Langenfeld SC. Hypoalbuminemia. eMedicine. 2010. Available at http://emedicine.medscape.com/article/166724-overview. Accessed on March 30, 2011. 10. Oshikoya KA, Sammons HM, Choonara I. A systematic review of pharmacokinetics studies in children with protein-energy malnutrition. Eur J Clinical Pharmacol. 2010; 66 (10): 1025-35. Available at http://www.ncbi.nlm.nih.gov/pubmed/20552179. Accessed on March 30, 2011. 11. Liu T et al. Kwashiorkor in the United States: Fad diets, perceived and true milk allergy, and nutritional ignorance. Arch Dermatol. 2001; 137:630-636. Available at http://www.archdermatol.com. Accessed on March 9, 2011. 12. Ahmed T, Rahman S, Cravioto A. Oedematous malnutrition. Indian J Med Res. 2009; 130: 651-654. EBSCOhost. Accessed on March 9, 2011. 13. Atalabi OM, Lagunju IA, Tongo OO, Akinyinka OO. Cranial magnetic resonance imaging findings in kwashiorkor. International Journal of Neuroscience. 2010; 120: 23-27. EBSCOhost. Accessed on March 9, 2011. 14. Cooper R. Hyperaldosteronism. Medline Plus. 2009. Available at http://www.nlm.nih.gov/medlineplus/ency/article/000330.htm. Accessed on April 4, 2011. 15. Dean RFA. The treatment of kwashiorkor with milk and vegetable proteins. British Medical Journal. 1952: 791-796. EBSCOhost. Accessed on March 30, 2011. 16. Dean RFA. Advances in the treatment of kwashiorkor. British Medical Journal. 1952: 798-801. EBSCOhost. Accessed on March 30, 2011. 17. Coward WA, Lunn PG. The biochemistry and physiology of kwashiorkor and marasmus. Medical Bullentin. 1981; 37 (1): 19-24. EBSCOhost. Accessed on March 9, 2011.